Interactive drama is more than just a new breed of entertainment software. As different research projects have shown, these systems can also be used for pedagogical and therapeutic purposes. The goal of these systems is to teach sophisticated problem solving skills by allowing the user to interact with compelling stories that have didactic purpose.One of the main attractions of narratives, independent of the medium in which they are presented, is that they elicit emotional response in their audiences. They have an affective impact and only engineers and authors who understand how the emotion system works can create an engaging story world. 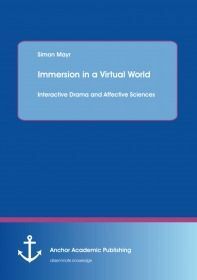 This work proposes that an interactive drama based on a model of the user’s affective state should be able to provide a truly immersive user experience.It becomes evident that research on interactive drama technology, especially with emphasis on affective modelling, is a highly interdisciplinary endeavour that draws - and has to draw - from many different disciplines.